Zones - Wagner Subaru Outdoor Experience - Midwest’s premiere outdoor adventure festival. If in doubt about where to go, just wander! The Wagner Subaru Outdoor Experience is divided into Activity Zones. Each area of the event has its own character and its own special attractions — make sure to check them all out. Our furry friends will have plenty to do at the Wagner Subaru Outdoor Experience. See if your pooch is a big air jumper in the Subaru DockDogs competition or let your furry friend have some play time at the Subaru Pooch Island off-leash dog park and swim area. Stop by the Best Breed booth for Yappy Hour treats and the Pooch Playground for dog activities managed by the Greater Dayton Humane Society. Let Wagtown volunteers watch your dog in Pooch Parking while you enjoy up to 90 minutes of the event dog free so you can do an activity yourself. Dogs are welcome, but they must be leashed and under control at all times. Always remember to pick up after your dog! Five Rivers MetroParks reserves the right to ask owners to remove dogs who pose a risk to event visitors or other dogs. Try a new outdoor skill or grab some grub, while Wagtown volunteers watch your pup! Love bringing your pup to the festival, but find there are times when you need both hands free? Just valet your pup at Wagtown Pooch Parking! Located near the bridge to the off leash dog park and Pioneer Shelter, you will find friendly, shaded, supervised doggie parking provided by Wagtown staff and volunteers. Dog lovers who are looking for a more playful experience should check out Subaru Off-Leash Pooch Island. This special park is conveniently located next to the festival and offers a place for your pooch to play off-leash. There’s even a doggie swim area in the lagoon near the islands. Pooch Island Dog Park closes at dark during the festival. Area supported by SICSA. Wagner Subaru Outdoor Experience personnel reserve the right to remove any dog that jeopardizes the safety of other dogs or visitors. Dogs must be ON leash when entering and exiting the off-leash park. Dogs are permitted to swim in the designated area ONLY. Dogs must have required local immunizations. Owners are responsible to clean up their dogs’ droppings while at Eastwood MetroPark. Owners must be with dogs at all times while in Pooch Island Dog Park. Owners are encouraged to have their dogs spayed or neutered. The Bike Village at Wagner Subaru Outdoor Experience will offer guests an opportunity to try all styles of bikes while learning from the country’s leading bike manufacturers, retail shops, race promoters and advocacy organizations. In addition, bike stunt shows take place throughout the weekend. See scheduled times for the Inspired BMX Stunt Team and Chris Clark Bike Stunt Show. Guests can try demo bikes or bring their own and test their skills on a variety of different types of terrain (helmets and signed waivers required). Toddler balance bikes, children’s bikes and various mountain bikes provide options for all interests, ages and ability levels. The Bike Village is conveniently located near the Mad River Trail, gateway to the “Nation’s Largest Paved Trail Network,” where you can experience more than 340 miles of off-street, connected trails. Thanks to these fine partners, there are many ways to experience biking at Wagner Subaru Outdoor Experience. Borrow a bike and test your mountain biking skills on log overs, ramps, bends, elevated treads, skinnies and rock gardens. Area supported by Bike Miami Valley. From group rides and demo bikes to balance bikes and Dayton Cycling Club Valet Bike Parking, red carpet treatment is waiting for event guests interested in cycling. Brought to you by Mad River Mountain Ski Resort and supported by Mike’s Bike Park. Check your skills on this Progressive Bike Ramps pumptrack. Imagine FREE camping at the EXPED Campground on the banks of the Eastwood Lagoon under the shade of stately sycamore trees. Camping at the event is a great way to take in all the action and still have a relaxing “home base.” We have spaces for tent camping, pop up campers and group camping. Camping registration begins at noon on Friday and lasts throughout the event. Public camping ends Sunday at 4 PM. All registered campers will be entered in the Campground Raffle to win excellent gear from EXPED Expedition Equipment. Register at the information tent located inside the main entrance gateway, Friday noon – 7 PM, Saturday 7 AM – 10 PM or Sunday 11 am – 4 PM. Those checking in Friday night after hours can set up and register Saturday morning. Limited parking is set aside for campers near the campground. Let the parking staff know that you are a camper as you make your way down the park road so you can more easily access the camping area. Visit the information tent located inside the main entrance gateway to the festival beginning Friday at noon. Those checking in Friday night after 7 PM can set up and register Saturday morning. Friday and Saturday permits are available. Quiet hours will apply in the tent camping area. If you wish to socialize, please move conversations to the night owl campfire that will be located outside of the main camping area. Night Owls: For those who like to socialize. A communal fire pit will be available. Loud voices and other noises carry, so please use hushed tones as you celebrate a great weekend. Please be respectful of your camping neighbors. A limited amount of camper space will be available at the lake entrance of Eastwood MetroPark (1401 Harshman Rd.). Campers must be pop-up in style or less than 15 feet long. No RVs. Camper space is primitive. Restrooms are available, but grey water dumping and electricity are not. Camper trailers can be unhooked and parked at the designated spaces at the lake side of Eastwood MetroPark. The pull vehicle can then be driven to the event (1385 Harshman Rd.). Biking to the event is another option thanks to a separated path on the new Harshman Rd. bridge that connects both sides of the park. Pop Up Camper parking is limited to the first 20 pop up campers. Register at Information Central when you get to the event. Additional designated camping spots will be made available for boy scout, girl scout, college and other groups of campers. Scout groups are encouraged to register at miamivalleybsa.org to reserve your spot. For more information please contact Miami Valley Council Scout liaison Justin Lawrie at jtlawrie@gmail.com. For more information on the event and your scout troop please email events@metroparks.org. All campers can set up beginning Friday at noon and must check out Sunday by 4PM. Campers must provide all of their own equipment. Slacklines are welcome in the campground. Hammocks are permitted if suitable trees can be found. A few community fires will be managed by campground staff. Please do not dig additional pits or scarify the land. Food can be cooked on camp stoves or traditional backpacker stoves. Five Rivers MetroParks supports and encourages Leave No Trace Principles. Alcohol must stay within the designated event area and is not permitted in the campgrounds. Restrooms and drinking water access are available, although it is located near main restrooms. Electricity is not available in the campground. Five Rivers MetroParks is not responsible for lost, stolen or damaged personal property. All pets must be kept on a leash, and please dispose of pet waste properly. Remember to be considerate of other visitors. Quiet hours are 10 PM – 8 AM both nights. Security will be on site 24-7 for any concerns. You can reach a MetroParks Ranger by calling Montgomery County Dispatch at 937-535-2580. Have you ever wanted to cast a fly rod? Then come to the Fishing Village to learn how. With a 40-foot casting pond and live fish, this new feature to the event will be hard to miss. Thanks to the Miami Valley Fly Fishers, visitors can learn the mechanics of a cast. Veteran anglers and beginners are welcome to test their skills and refine their technique in our casting pond. If fishing from a boat is your thing, enter the Buckeye Kayak Fishing Challenge. The Send It! Action Zone will be the full of excitement at Wagner Subaru Outdoor Experience. With our climbing wall and slackline park, this is a great place to test your ability or try something new! Try Climbing! at our Climbing Wall, brought to you by Rock Candy Holds, and supported by Wright State University Outdoor Resource Center. Try Slackling! on different heights and lengths of slackline in the Try It! area or attend one of the Slackline Workshops. Watch It! 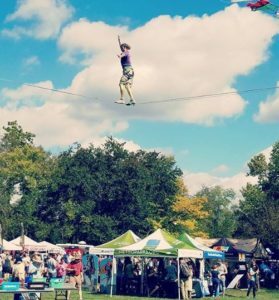 Watch professional slackliners perform high action flips, bounces and twists on the Trickline, or perform aerial maneuvers on the highline over the Beer Garden, or traverse the Waterline, over the Lagoon near the Pioneer Shelter and Pooch parking. The Mad River Run is the place to be for exciting moving water competitions, demonstrations and classes all weekend long. Hang out on the banks and watch the shows or get in on the action yourself. See below for the full lineup of activities and click through for more information. Welcome to the Mad River Run. This is the place to see whitewater pro boaters throw down sick tricks, get an idea of how various rivercraft would work for you, see SUP professionals surf the wave and more. Are you a recreational boater? Understand the safety precautions of playing in the wave and how to make the river and in particular this feature, a fun place to play for you. Paddle the Mad River for FREE! Thanks to the Twin Creek Canoe and Kayak for providing kayaks, paddles and PFDs. Sign up to take a quick, one mile, group float with safety boaters. Spaces are limited. Pre-registration is suggested at the Twin Creek Canoe and KayakInfo Booth next to the event entrance. Check-in at the event Info booth located by the event entrance at least 10 minutes prior to departure time, or your spot may be given away to someone present. Must be 14 years of age or older. Watch as the professional whitewater boaters throwdown cartwheels, mcleans, pirouettes and more. Pros will be surfing the wave in kayaks and SUP. Bring your own boat to play in the feature between shows or try out one of the Hala Gear demo SUP boards! Thanks to Whitewater Warehouse for offering this exciting opportunity for beginners to try out the whitewater feature in an inflatable kayak with pro paddler, Bernie Farley as your instructor! Inflatable kayaks are a great beginner vessel for navigating the rapids of the Mad River! Register at the Whitewater Warehouse tent near the Mad River Run. The Osprey Backcountry Zone, brought to you by Great Miami Outfitters, your local outdoor outfitter. Great Miami Outfitters has been supplying the Dayton area for 11 years with quality gear and expert advice, rentals and outdoor education. Check out the Osprey Fit Station that will be on site. Check out all of the racking options to haul your toys where you want to go! Have a chance to meet, greet and buy from the manufacturing brand experts themselves. Here you’ll find many of the brands you love at the Centerville location. Chill out around the campfire and test out an alternative way to backpack, with the Grand Trunk hammock lounge provided by Great Miami Outfitters. Swing away and imagine this comfortable sleeping equipment on your next backcountry canoeing or camping experience or in the comfort of your own yard. Great Miami Outfitters staff will be available to answer questions about styles of hammocks and about camping and backpacking with a hammock —they’ll even wake you up if you snooze too long. Are you ready to try something new or hone your outdoor skills in an activity you already enjoy? Professional instructors will offer hands-on clinics in map and compass basics, camp cooking and more! This is your opportunity to test various forms of watercraft. Kayaks and canoes abound on the banks of the Eastwood MetroPark Lagoon! See pro kayakers do flips and tricks in the Mad River Run. Enter the Dayton Kayak Fishing Challenge for a chance to win cash and prizes. Enter the SUP Surf Competition or SUP Cross Race for a chance to take home the trophy and be entered to win a Badfish SUP Board. Test your skills on the Pumptrack, brought to you by Mad River Mountain, and supported by Mike’s Bike Park. This rolling feature will be a blast! Riders will practice how to balance and handle their bikes, skateboards and scooters on this flowing course. Thanks to Innova Discs and Dayton Disc Golf Association, and Hazy Shade, a temporary public course will be available for play at the Wagner Subaru Outdoor Experience on Saturday and Sunday. Bring your own disc or borrow a disc at the Dynamic Discs Booth. Please visit our information tents to sign a Risk and Release waiver, or download and complete a waiver to bring to the festival. Those under 18 years old must have a parent/guardian sign the form. Expand your outdoor adventure possibilities; talk to a Thule representative and outfit your car with rack that is right for you. Accessories will be available for sale. Redeem your coupon for the Mad River Mountain Tubing Pass, if you were one of the first 50 Subaru drivers to enter the event that day. Coffee will be conveniently vended in the Wagner Subaru Village. Kids are encouraged to stop by the Youth Adventure Zone to learn more about outdoor adventure and healthy active lifestyles through games and activities. Thanks to several community organizations, a variety of fun programs and demonstrations are available in the Youth Outdoor School for all to enjoy! Staff from these organizations will be on hand to monitor activities and to focus on safety, fair play and positive reinforcements. All youth adventure zone participants must turn in a signed release of liability waiver prior to participating. Those under 18 must have parent/guardians must sign the form. Please visit our information tents to sign a Risk and Release waiver, or download and fill one out for your child to bring to the festival. Xcel Sports Medicine will offer a variety of functional and endurance based activities which include: vertical testing, jump roping, burpees to box jumps, and the Bosu Basketball challenge. Each young hiker or parent will receive a Nature Bingo board as we hike try to make a bingo. Those who get a bingo will receive a small prize. For children of all ages, infants and up! All children must be accompanied by an adult. Meets at the Youth Outdoor School. Join Learning Tree Farm for a fun interactive story time. MetroParks Meet animals that you might find in your backyard and learn how to keep them safe and wild! Learn the basics of building a fire. Including what type and size wood to use, the different methods for starting a fire, and the proper way to light your fire. Includes safety practices! Let the folks at Dayton Metro Library lead you an a trail of tales. Get your youngsters out on the trail for a guided hike with other families! To participate in activities at OutdoorX, you must sign a Risk and Release waiver. Those under 18 years old must have a parent/guardian sign the form. Save time at the event by downloading, filling out and bringing a signed a waiver with you! Jam out all weekend long!